When holiday baking season hit last November, I shopped the local Fleet Farm repeatedly to buy up their stock of Marshmallow Fluff. 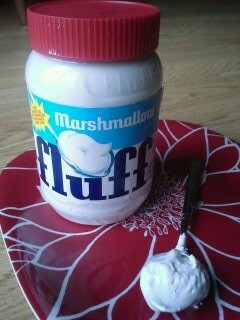 Living in the midwest, it’s hard to find fluff (I’m not talking creme here–it has to be fluff) on store shelves. I’ve purchased online before, but when it shows up at Fleet Farm November through December, I save myself shipping costs and buy enough to keep me going for the year. Next on my ‘mallow trail was Attempt in Domesticity‘s (awesome blog if you’ve never been) gargantuan mug-topping marshmallow. Reading about her marshmallow-making experience reminded me that this was something I’d done before and could do again. Then A/D turned me on to Plush Puffs. This maker of “gourmet” and “artisan” marshmallows was calling my name–I lost no time in following A/D’s example and ordering from their odds-and-ends selection. 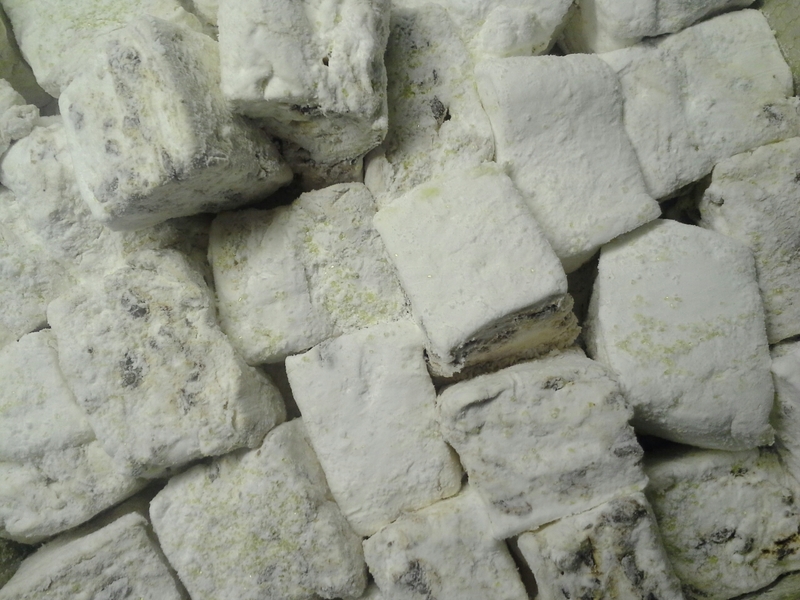 These marshmallow remnants are less expensive than their prettier cube cousins, but just as yum. My first order was for caramel swirl (! ), vanilla bean, and cinnamon. When they had a 20% off sale, I collected pumpkin pie, mochaccino, and chocolate chipetta flavors. 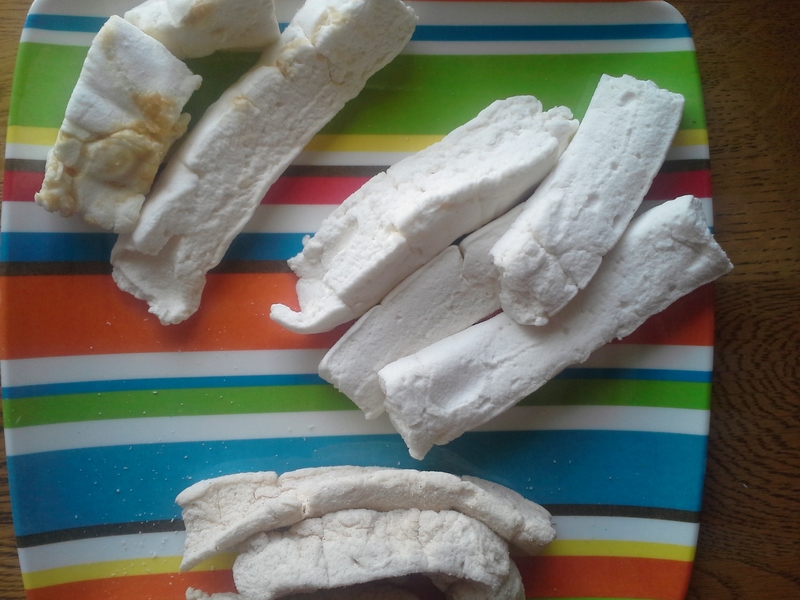 These marshmallows are worlds apart from the packaged jet-puff variety. Plushies are soft, fresh, fragrant, and full of Real Flavor. Am a huge fan. 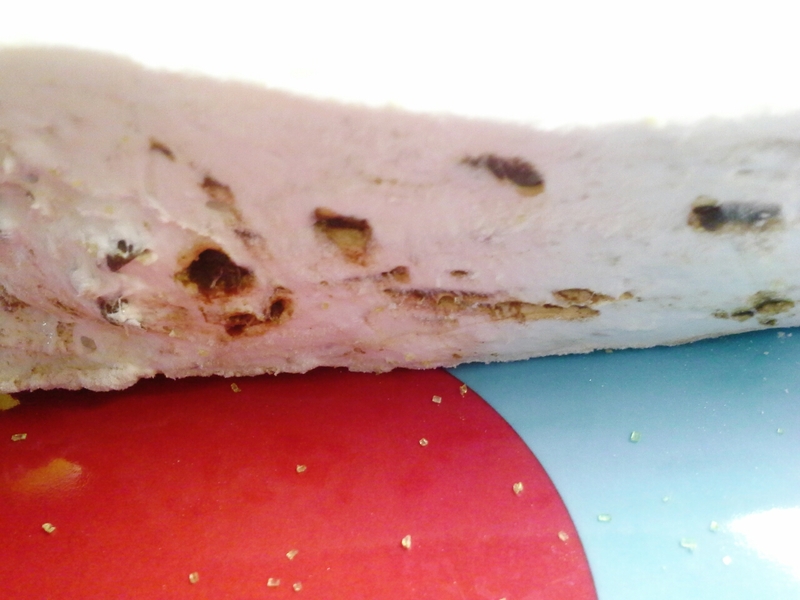 plush puff purchases–see the caramel swirling upper left? Finally, I threw a challenge out to A/D saying I would make mallows if she’d take a turn at the caramel sauce she’s been wanting to make. 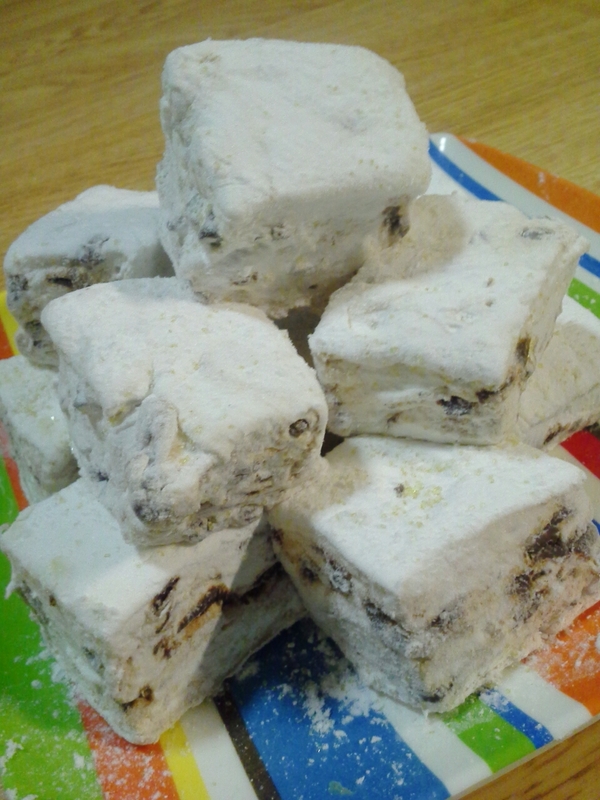 And I’m here to say that I made my mallows! Just as A/D had said in her post, nothing to it. The part where the whipped mixture went into the greased pan to firm was a bit sticky, but outside of that it was an easy task. I did veer ever-so-slightly from the recipe just twice: Plush Puff’s chipettas inspired me toss half-a-bag of mini chips into my batch before letting them set. Also, I was shy of the 1/2 cup powdered sugar I needed for dusting at the end, so mixed in a handful or so of gold sanding sugar. (How could that not be a good addition?) It was indeed pretty and next time I’d replace even more of the final dusting sugar with a more brightly colored sugar. My recipe follows and I encourage you to take up the marshmallow challenge. Or better yet, challenge yourself to make whatever it is you’ve been meaning to make for a very long time. gorgeous–anyone else think it looks like the entrance to a deep cave of snow? Line 13×9-inch pan with foil; coat with cooking spray. 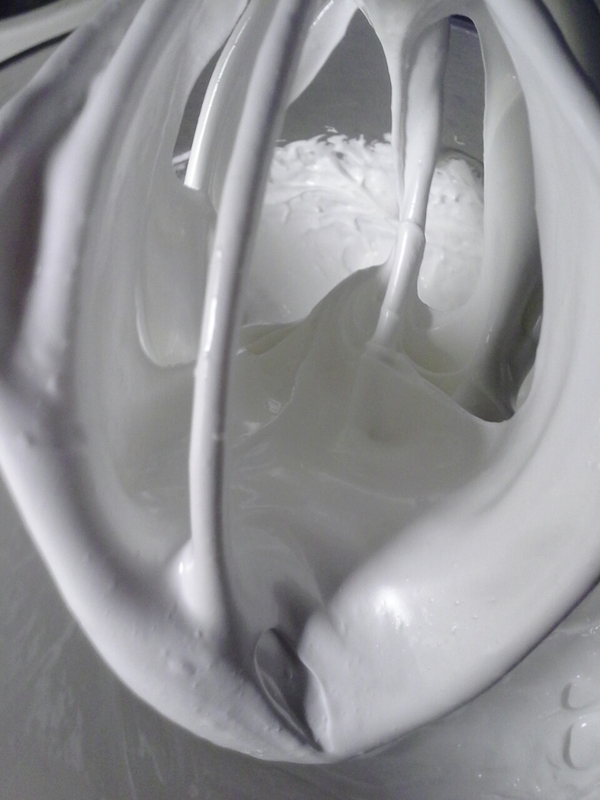 Pour 1/2 cup cold water into large bowl of heavy-duty stand mixer fitted with whisk attachment. Sprinkle gelatin over water. Let stand 15 minutes until gelatin softens and absorbs water. In heavy medium saucepan, combine sugar, corn syrup, remaining 1/2 cup cold water, and the salt; stir over medium-low heat until sugar is dissolved. Increase heat; bring to a boil. Boil, without stirring, until mixture reaches 240°F. With mixer at low speed, gradually pour hot syrup down side of bowl into gelatin mixture. Gradually increase speed to high. Beat 15 minutes or until mixture is thickened and stiff. Add vanilla; beat 30 seconds longer or until well blended. In large bowl, toss together potato starch and powdered sugar. Sprinkle onto work surface. 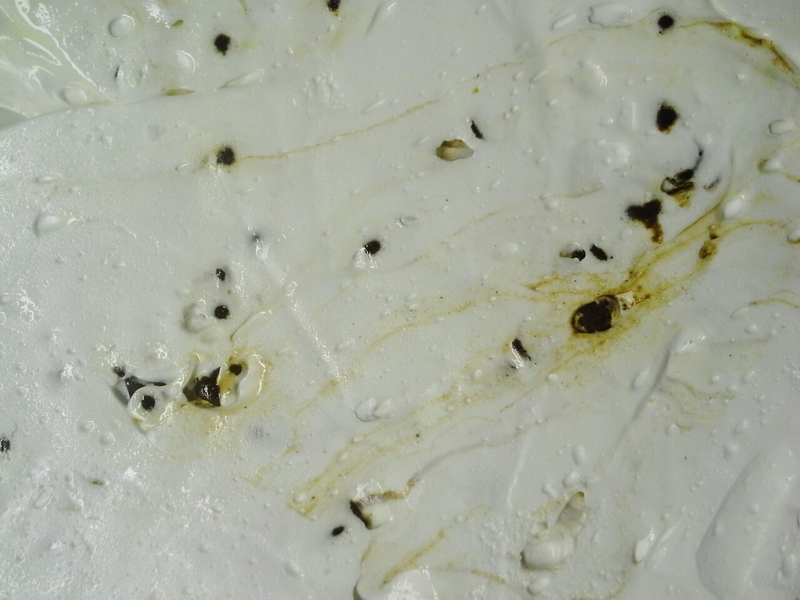 Invert marshmallow pan onto starch mixture; remove foil from marshmallow. Sprinkle some of starch mixture over marshmallow; pat lightly. Coat sharp, large knife with cooking spray. 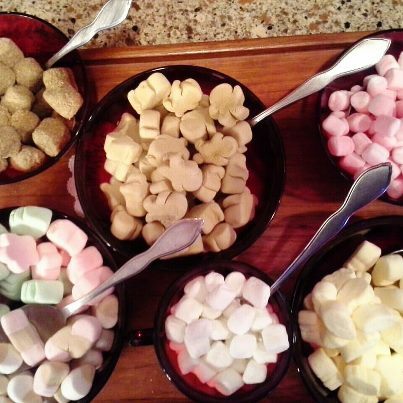 Cut marshmallows into desired shapes. (Can use cookie cutters, too.) Return cut marshmallows and starch mixture to large bowl; toss to coat. Transfer marshmallows to wire rack, shaking off any excess starch mixture. Love that you enjoy A/D. Have found her to be a kindred kitchen spirit. Let me know if you order from Plush Puffs. I’m becoming a bit of a groupie. Happy Thurs to you and thanks for ambling by:-) You’re a busy lady! Oh my goodness, I REALLY need to get me a mixer. Your post has inspired me to make my own marshmallows… heck anything that has caramel in it has my vote. great post! I told you, you can borrow mine anytime:-) They are so worth making though I’d advise a stand mixer (I picked mine up at a garage sale 0-:) as the mixture beats 15ish minutes. Nice to be able to wander while it does it’s thing. You’re gonna love these! Thanks for coming by. Thanks Liz! You’re a doll 🙂 There’s a great vintage kitchen appliances store near us that sells used mixers. I’m gonna have to convince Lobster to go there with me one of these days. Definitely gonna make my life a whole lot easier. Thanks for putting up this recipe. I thought you had bought the mug-toppers for you niece and nephew–did not know the Big One. Two pounds? wow. What was their reaction when they opened the gift? Thanks for coming round and glad you enjoy. Marshmallows are totally blank canvases, so lots of room for improv. 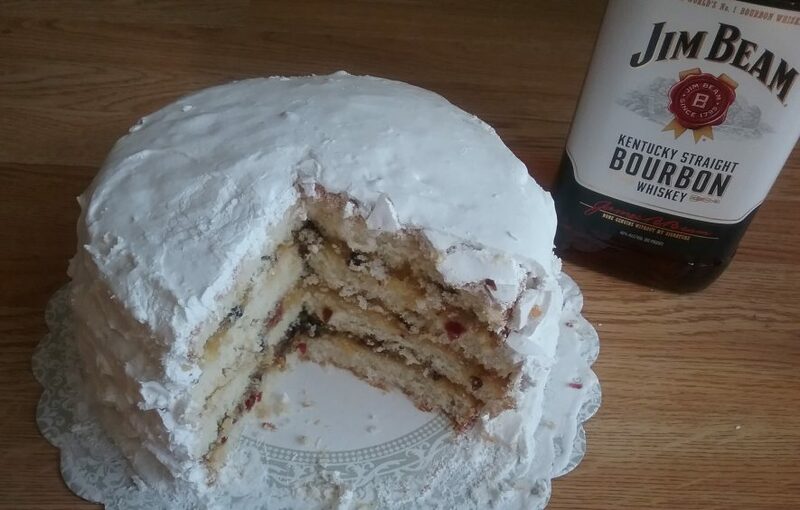 I have a friend who made vodka marshmallow and I can see possibilities for adding a wee drop of bourbon. Oh it’s on! My problem is Feb is my bday month and I always plan crazy elaborate parties so I’ve been busy, busy, busy. But I’m almost done with my prep so I can do more cooking! Happy birthday, J!!!!! Fun:-) Do you bake yourself a cake? Have fun party planning. Well, since I can now vouch for their delizious-ness, I guess I’ll need to try my hand at these! Thanks Liz! glad if you liked–have it on tonight’s “agenda” to make caramel swirl and bourbon varieties, though maybe bourbon-caramel swirl would be good, too? Let me know how your marshmallow session goes.